The shadowy political PAC "Real Democrats for Hoboken" which raised eyebrows for suspect political activities in 2011 resurfaced with two hit job mailers to sixth ward resident this week attacking Councilwoman Jen Giattino. The rampage was anticipated with Carmelo Garcia's rapid descent in the sixth ward City Council race and fits earlier Beth Mason talking points. The Keim hosted PAC doesn't show funds available on a 2015 NJ ELEC filing for the hit piece mailers leading many to suspect the PAC is acting as a financial front and a vindictive departure of lame duck Councilwoman Beth Mason. In 2011, Councilwoman Jen Giattino was one of a five member council majority passing an updated anti-wheeling pay to play ordinance. 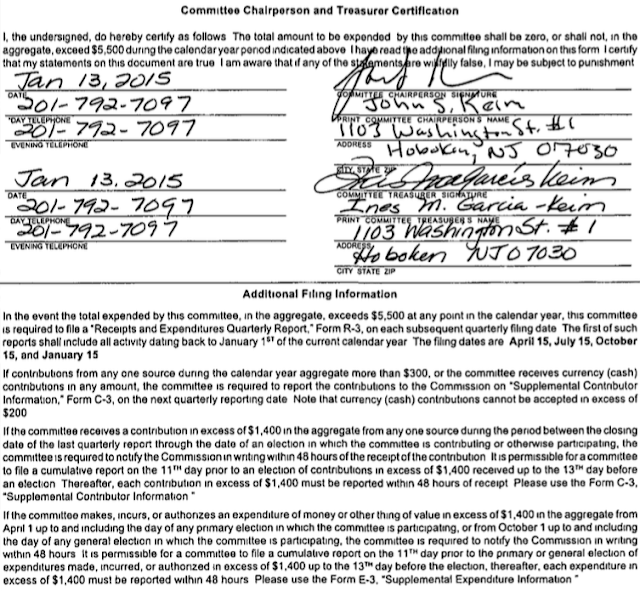 The ordinance limited PAC contributions in Hoboken political campaigns to $500. With two mailers this week, the Keim backed PAC violates Hoboken's ordinance twice in the same week. John Keim recently endorsed the entire Russo faction Carmelo Ticket on his Facebook page asking as Michael Russo earlier for an Old Guard sweep. 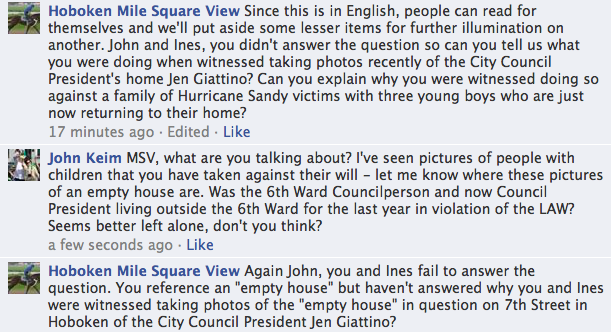 In the Facebook post, he states Carmelo Garcia did a good job in the Hoboken Housing Authority. Ines Garcia Keim has been seen squiring around second ward council candidate Peter Biancamano who MSV reported took a $2,500 loan from Michael Russo last month. Eduardo Gonzalez, a council candidate in the fifth ward against Councilman Peter Cunningham was listed as the treasurer of the Real Dems PAC prior to Ines Garcia Keim in 2012. 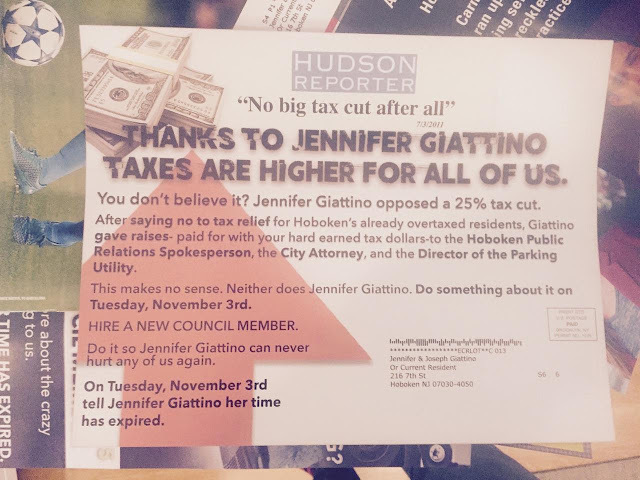 The latest hit job mailer falsely claims Councilwoman Jen Giattino increased taxes. She was elected in 2011 and has voted consistently reducing and holding Hoboken's municipal taxes flat. A copy of the mailer is seen below riffing on a well-worn Beth Mason gag about returning "the surplus." Beth Mason and her pals John Keim and Ines Garcia Keim are back delivering false information to sixth ward residents claiming tax cutting Councilwoman Jen Giattino raised taxes. After Giattino came into office in 2011, she voted to lower or keep taxes flat annually while Beth Mason is of course infamous for trying to simultaneously destroy the hospital, HUMC and bankrupt Hoboken. John Keim attempts to repeatedly avert the question employing a commonly used Masonista lie before asking "where these pictures of an empty house are." His non-denial denial is revealingly followed with an attack rhetorically claiming the Giattino family being forced to move out of their home after Hurricane Sandy marks the councilwoman's status is "in violation" of the law. The "illegal" allegation John Keim references was also voiced by others close to Carmelo Garcia in City Council meetings leading to some anticipation Beth Mason would launch another lawsuit in an attempt to eject Councilwoman Giattino from her council seat. Neither John Keim nor Ines Garcia Keim answered the question posed to them by MSV and quickly vanished. Back in 2010, Keim who had submitted and seen published a guest piece on MSV wrote of his hopes to encounter MSV at the election polls in the 2010 fourth ward special election. In an unedited email below he writes to Lane Bajardi, Ines Garcia Keim and Sara Stojkovich and condemns Hoboken Revolt, a citizen tax group which sprang up against tax increases. Related: Ines Garcia Keim's name surfaced in emails in the Bajardi v Pincus frivolous SLAPP-suit revealing private board discussions of local groups like the Quality of Life Coalition she handed over to a small dwindled group of Masonistas. John Keim voiced support for that frivolous SLAPP-sut and predicted the demise of Grafix Avenger and that this Horse would lose his "shirt" to the Mason supported SLAPPers. The Hoboken Journal with others detailed the earlier illicit activity of the Real Dems back in 2011. Talking Ed Note: Is breaking election laws in Hoboken anything one would call Reform? What can Hoboken expect next from the Keim's Real Dems? Perhaps it'll be regurgitating another Beth Mason lie Jen Giattino went to the Super Bowl on the taxpayer's dime? 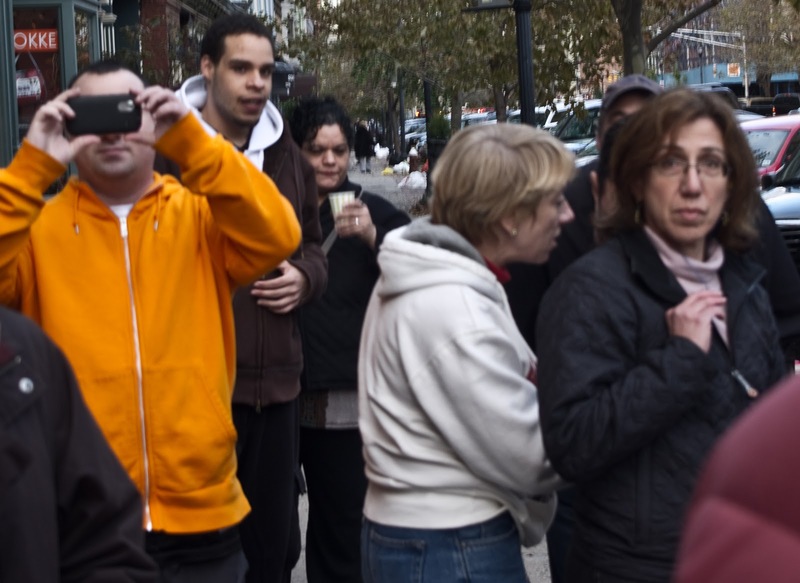 Ines Garcia Keim (r) with Beth Mason after MSV was assaulted by Beth Mason political operatives minutes earlier in broad daylight back in 2012 during the Hurricane Sandy emergency on Washington St.
James "FinBoy" Barracato (l) takes a photo to capture a follow up moment. John Keim and Ines Garcia Keim are listed as Chair and Treasurer respectively of the PAC: Real Dems for Hoboken in this 2015 filing with NJ ELEC.